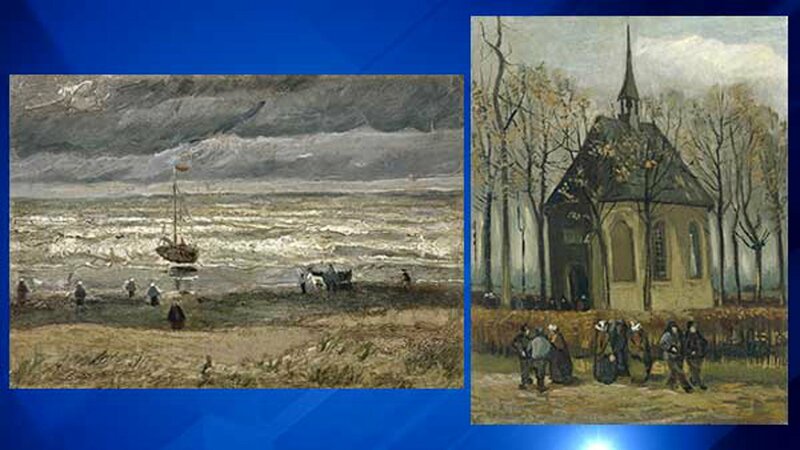 Two paintings by Vincent Van Gogh stolen in a heist in the Netherlands have been found, 14 years on, after a "massive" investigation into a group linked to the Italian mafia. The artworks were taken from Amsterdam's Van Gogh Museum in December 2002 by thieves who broke into the building using a ladder to access the roof. The paintings "Congregation Leaving the Reformed Church in Nuenen," dating from 1884/85, and "Seascape at Scheveningen," from 1882, were found wrapped in cloth in the basement of an apartment belonging to Raffaele Imperiale -- a rich and powerful drug dealer, according to Italian prosecutor Filippo Beatrice. The discovery in the village of Castellammare di Stabia was part of a larger investigation into the Amato Pagano clan, an international drug smuggling group affiliated with the Camorra, Naples' notorious mafia. Maria Vittoria De Simone, a prosecutor with Italy's anti-mafia department, said Imperiale is believed to be on the run in the United Arab Emirates. Italian authorities have requested his extradition. Apartments, villas and a plane worth an estimated $22.3 million (20 million euros) have also been seized as part of the ongoing investigation. A video released following Monday's raid showed the Italian police pulling back a mirrored wall in a home gym to reveal a cavernous underground space that concealed the plane. For the Amsterdam museum that once housed the long-lost paintings, their recovery is an enormous relief. "The paintings have been found! That I would be able to ever pronounce these words is something I had no longer dared to hope for," said museum director Axel Ruger. "We have been waiting for this moment for 14 years." Both paintings hold "huge" historical value according to the museum, since the Dutch master's watery seascape is its only work dating from his years spent in the Hague from 1881 to 1883, and serves as an important example of his early style of painting. The small canvas of Nuenen church, where the artist's father was a Dutch Reformed Church pastor, holds "great emotional value," according to the museum's website. It was painted for his mother and reworked after his father's death in 1885, with the addition of churchgoers wearing shawls of mourning. An art curator verified the paintings' authenticity and firmly concluded they are real before the discovery was announced Friday. Both works are said to be in good condition, though paint has flaked away at the bottom left corner of the Scheveningen scene and there is minor damage to the edges of the Nuenen church painting. It is not known where they were stored following their theft from Amsterdam. The FBI gave the paintings a combined value of $30 million in their list of "top ten art crimes" in 2005. At a press conference in Naples, Ruger expressed a "great debt of gratitude" to Italian police and prosecutors for their ongoing efforts to locate them. "After all those years you no longer dare to count on a possible return," said Ruger. "It is really a major step that the paintings have been found." While museum officials are anxious to return the artworks to their home, they will have to be patient while the paintings are held as evidence for a criminal trial in Italy. The date of the hearing has not yet been announced as Italian police are still pursuing the investigation. But for the museum, which houses the world's largest body of Van Gogh works, the eventual return of the stolen paintings will fill an important gap in its 800-work collection.